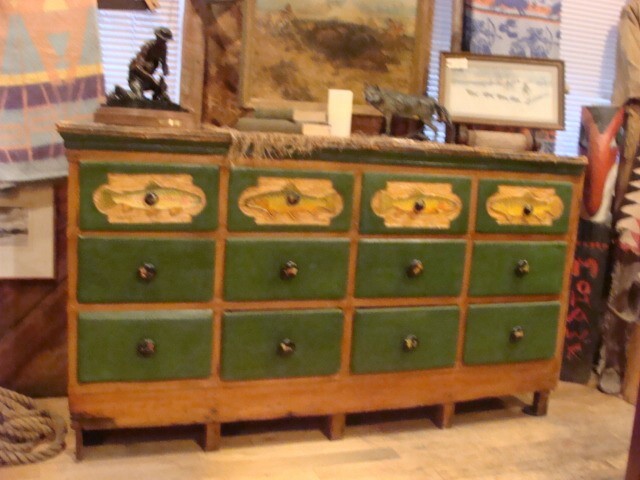 Genuine Antique, 100 yr old 12 Drawer Cabinet from an Apothacary in Dillon Montana. It has been carved with 4 Different MT. Trout on top 4 drawers and 12 diff. hand painted "flys" on each knob. More pictures by request. Genuine Antique, 100 yr old 12 Drawer Cabinet from an Apothacary in Dillon Montana. It has been carved with 4 Different MT. Trout on top 4 drawers and 12 diff. hand painted "flys" on each knob. More pictures by request. Please email cowboycabin@centurytel.net with questions or call 406 270-2842.